Cowboys are not Cassie's weakness...until the most famous cowboy on the planet sets his boots in her path. In truth, Robbin's far different from the image he projects. Disillusioned with fame, he has retreated to his dad's ranch to reconnect with the land and people he loves...and something about Cassie stirs deeper changes than he'd bargained for. As much as Cassie tries to avoid Robbin, she's drawn to his struggle to become a better man. Are they about to play out a classic romance, with the glorious Teton mountains as a backdrop? Or will their notions of each other prove as false as the cowboy mystique once the charm has worn off? "A novel of richness and depth. Cowboys Never Cry is a poignant story of love and loss and the healing that can come from the most unexpected people in the most unlikely circumstances. Looming over the story are the beauty and grandeur of Wyoming's Grand Tetons and the almost magical influence that nature exerts on human lives. If you haven't yet read Tina Welling, you don't know what you've been missing. Start here! Start now!" "With plenty of humor, as well as serious introspection and heartwarming moments, this is a wonderful story of appealing characters finding love and contentment in life." "Tina Welling has done it again. Cowboys Never Cry is a big-hearted romp set against the gorgeous landscapes of the American West. Cassie Danner is a tough, generous, grieving protagonist. She also has a sense of humor as grand as the Tetons. This novel is a heady gallop through the tangled thickets of love." "Tina Welling has a sharp eye for the west and an ear to match it. Pick up the book and join her charming characters for a romance-filled ride through Wyoming's spectacular backcountry." "You'll love Cassie Danner, a cowgirl with an environmental bent, as she struggles to overcome an old love and embrace a new one. Cowboys Never Cry is as satisfying as the smell of sage in summer rain." "Tina Welling's newest novel, Cowboys Never Cry, is a lively romantic romp that blends the landscape of the heart and the fragile West where real cowboys and cowgirls really do ride off into the sunset." "Cassie's struggle to overcome the loss of her husband through hard work in a fiercely beautiful and sometimes dangerous landscape makes her a particularly powerful heroine. Her independence is itself an act of defiance against grief. While examining the intricacies of emotional wounds, Tina Welling also miraculously manages to capture the awesome beauty of Wyoming. If you care about the monumental strength of the tender-hearted, you'll love this story." "A charming, western romance sure to please readers." -- Jo-Ann Mapson, author of The Owl & Moon Cafe and Solomon's Oak. "Tina Welling is a wonderfully fresh voice in women's fiction. 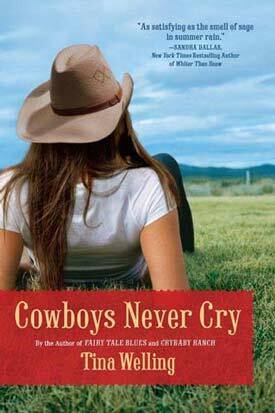 Cowboys Never Cry will keep you up all night reading--and rooting for wounded characters who heal each other through the power of love." "Welling delivers a winning combination--the cowboy who isn't easy to love and the modern woman who sees through all his pretenses. A novel about a contemporary courtship that is as fresh as today's headlines and as classic as the old West."